This site is about our travels with and without our tandem kayaks, Nessie (our original kayak) and Clem (our new kayak). We've been lucky to visit much of the US on our travels. We've taken either Nessie or Clem on several of our trips and have greatly enjoyed quiet water paddling in them. But sometimes they have to stay home--you can't get a 16 feet long kayak in the overhead bin on an airplane. Nessie is a 16 feet long Wilderness Systems Pamlico XL. We purchased her several years ago after getting hooked on kayaking on a trip to the NC Coast. My wife named her Nessie after the Loch Ness Monster. Nessie is strictly a quiet water kayak. No whitewater. She rides on the top of our mini van when she travels. In 2010 we added a new kayak to our collection, Clem. Clem is a Wilderness Systems Pamlico 135T and is considerably shorter than Nessie. Clem just fits into our new RV. We plan to take Clem on trips where we can take the RV. 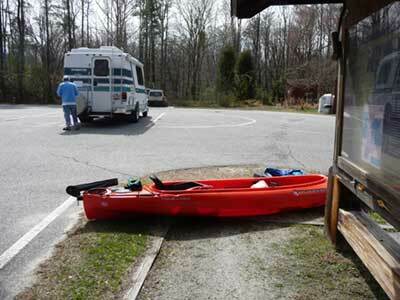 Or first trip with Clem and the RV was Merchant's Millpond State Park. Both Clem and the RV worked great. Nessie has proven to be a wonderful traveling companion. We've taken her on many trips including trips to Maine, Vermont, New Hampshire, Pennsylvania, Badlands of South Dakota, Grand Teton National Park, and Glacier National Park. And of course we've taken her on trips closer to home in North Carolina, Virginia, and South Carolina. I've provided articles and photos of many our trips. Travels with Nessie Home :: Site Map:: Contact webmaster@ncsparks.com-email us:: Copyright Leslie Sparks 2006, 2007, 2008, 2009, 2010, 2011, 2012,2013,2019:: Last modified: November 14 2014.